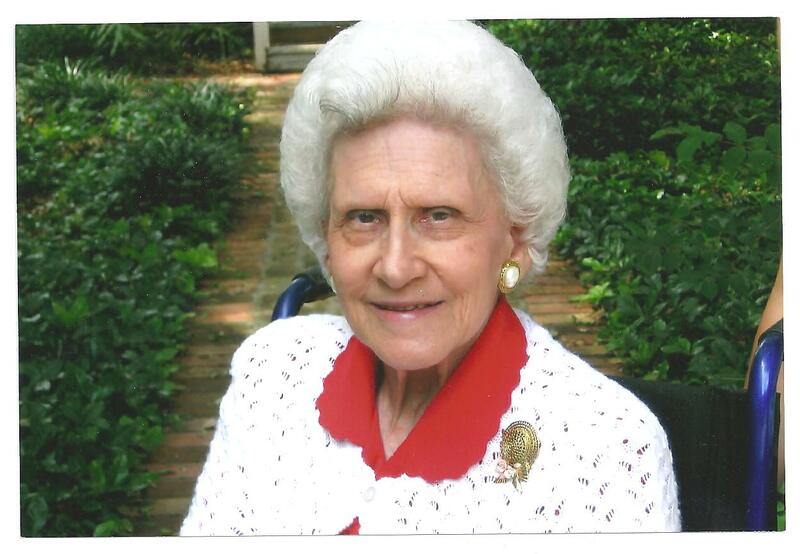 My great aunt passed away this past Sunday. I know for many people a great aunt is a more distant relative, someone they only see a few times during their life, but my great aunt was like a second grandmother to me. She never married and didn’t have children of her own. She was handicapped her whole life and my grandmother took care of her, so she was a part of all of our family events and gatherings. When my grandparents moved from New Orleans to live next door to my family after Hurricane Katrina she moved with them into a retirement community right around the corner from my grandparents’ new home. And when she was no longer able to manage her own apartment, she moved across the street into the nursing home. My great aunt, Eva Marie Hubert. Isn't she lovely? She was 80 years old, but she was mentally sharp as a tack, remembered everything, and didn’t even need reading glasses to see things perfectly. She was born in 1931 and contracted polio when she was only 10 months old. For her entire life she wore braces on her legs. She used a walker, and later a wheelchair when she lost the strength in her arms required to use the walker. My husband and I went with my family to visit her on Christmas Day. She was sitting up in her chair, looking very frail and incredibly thin, but talking about how she didn’t want to miss the Saints game on Monday night and her friend who was bringing her a pecan pie later on. She loved to give gifts. As a child I remember that every time we saw her she’d have picked out a few little things for us and have them wrapped up nicely, even after she was retired and had very little money to live on. 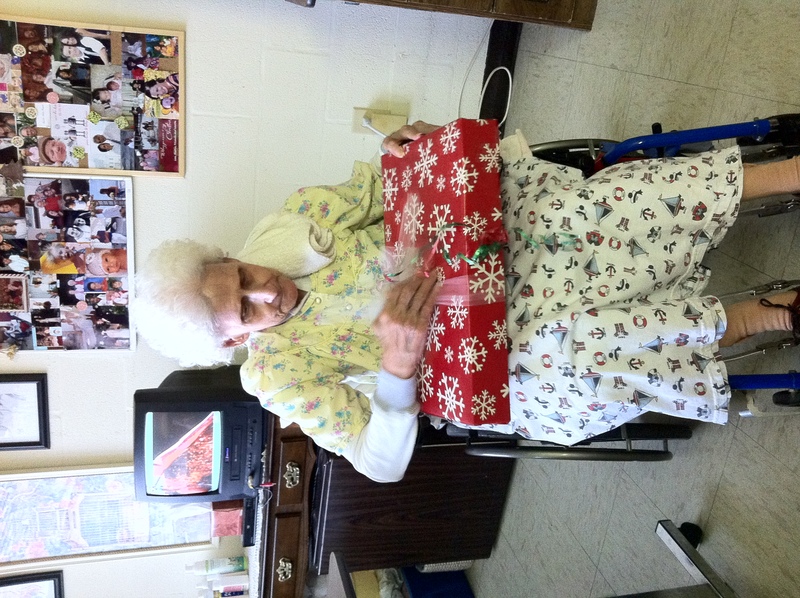 Even in the nursing home, she would take candy or little things that people brought to her and tie them up in little plastic bags and hand them out to others in the nursing home who she thought looked sad. This Christmas she decided to give each of her grand-nieces a piece of jewelry from her own jewelry box. A few days after Christmas she went into the hospital with pneumonia and didn’t recover. It’s always sad to lose someone, but I genuinely know that she was ready to go. She had lived a very full life and she wasn’t afraid to leave it. I think my grandmother will be affected the most by her loss as she has been caring for her sister since she was a little girl, but we are all thankful that she isn’t suffering and that she lived such a long, full life. While this post is partly meant to remember and to celebrate my great aunt, it’s also about those of us still here. Even though my aunt has been steadily declining over the last few years, the finality of her death has really impacted me. It may not be as jarring or as tragic as a sudden death or the death of someone very young, but it’s still strange to me that she was here and we were talking with her just two weeks ago and now she’s not anymore. It’s made me realize how attached I am to this life, in spite of all the little things I find to complain about. I was talking to Jonathan a few nights ago about how there’s a sense in which I feel that I, as a Christian, am not supposed to fear death. I’m not supposed to long for more of life. I’m supposed to embrace the time I’m given, but rest knowing that when this life is over I move on to something greater. But if I’m honest, I do fear it to some extent. I like this world. I love doing life with my husband and having a home together. I want to have babies and to see all of the amazing places in the world. I want to experience cultures, learn languages, adopt a child, write a book. Here is a secret about me that is going to sound terribly morbid. For some reason I could never identify, I have always believed I would die young. I have no reason to think this –no medical conditions, no family history of sudden, early death, no impulse to engage in dangerous activities. It’s just something I’ve always believed somewhere in the back of my mind. It wasn’t until my relationship with Jonathan got really serious that I was able for the first time to even imagine myself growing old –because I can imagine him growing old and I can’t imagine ever being without him. And I think maybe it is this underlying belief, however unfounded, that subconsciously drives my overwhelming desires to travel and see and go and do and be and not waste time doing things I don’t care about. I know that as a Christian I am supposed to feel that death only ushers me in to something greater than I can ever imagine – the presence of God. And I do believe that. But there’s something even about heaven that I’ve always found frightening. Jonathan says it is because we cannot wrap our minds around something as large as eternity and it’s unsettling to think about the unknown and the unknowable. We are always somewhat afraid of what we don’t know and can’t anticipate. Sort of like how I (and I think many people) felt right before I got married—you know it’s going to be the most wonderful thing and you are excited for it, but at the same time, you are sort of anxious because it’s something you personally have never experienced and can’t quite imagine. You don’t have a mental framework for it. It is unlike anything you’ve done before. I am not one of those people who can just pretend to have the “right” perspective on everything. I believe that there are people who genuinely feel more excited about heaven than earth, who have a more eternal perspective on life and death. But I admit that I am not there yet. And while this distresses me because I have always wanted to give the “right” answer, to have the “right” attitude, to say the “right” thing, I also think there’s something to learn from my own frailty. If I recognize that I love life and say that I’m so grateful for the minutes and the hours and the days that I’ve had and that I hope to have, why do I still spend so much of that precious time just trying to get through it? Why do I sit at work and wish the time away? Why do I spend the week just trying to push through so that I can get to the weekend? If I make the goal of each day to get to the end of it so I can once again crawl into my lovely bed, will those days add up to a life whose goal was just to reach the end of it? And isn’t that the exact opposite of that driving force that (sometimes unhealthily, I admit) beats with my heart Go everywhere. See everything. Don’t waste your days. Conclusion: it’s ok that I can’t grasp eternity and that in my frailty, I even find it somewhat frightening. There is grace for that. It’s ok that I love life. It is a gift. I can’t place all of my value on things I will gain or experience in this life, but I can take these feelings and allow the Holy Spirit to use them. To say to my wandering heart, focus yourself. Live with intention. Stop running through your days just trying to make it to the end. Be attentive and be present, even when all you want to do is go home. Be mindful that the life you want to live is made up of what you do with your individual days, not just a handful of special moments. So…Aunt Nan, I hope you’re dancing for the first time in your life with no braces on your legs. I have no way of knowing how many days I have left, if there is any validity to my feeling that I will lead a short life. But I trust that whenever my time here is over, there will be grace to bring me home. Without fear. And I sincerely hope, without regret. I loved this post. You brought up every thought and fear I have about life and death. I can not even begin to explain how much I understand what you are saying here. thank you for reminding me there is grace, that life is a gift, and that I am not the only one out there befuddled by this concept. And, your Aunt Nan is DEFINITELY dancing away in heaven. Thanks for your comment and for reading my blog. I feel a lot of pressure to have the “right” feelings and thoughts about things, but sometimes I think it’s easier to accept that I don’t than to try to force myself to feel the way I think I should.